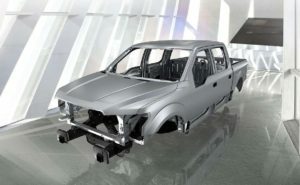 The appearance of exterior aluminum over a largely steel structure on a variety of new vehicles — perhaps most notably on the 2019 Chevrolet Silverado and 2019 Ram 1500 — means collision repairers might need to invest in dedicated aluminium tooling and equipment as well as training to remain competitive. Just because an OEM doesn’t deem exterior aluminum structural (a designation which could vary by part and OEM; don’t assume anything without checking procedures and positions) doesn’t mean the metal magically behaves like steel. The laws of chemistry and physics will still apply to generate corrosion and potentially even pose a hazard to shop personnel. Hence, you need to arm your shop accordingly. Recouping the investment necessary to properly manage the properties of either kind of automotive aluminum could demand higher labor rates for the nonferrous metal, and the most recent “Who Pays for What?” data from October 2018 does show shops charging more for aluminum. Ford was the most mainstream automaker for which three consistent years of data was provided to us in “Who Pays?” excerpts. If other popular OEMs continue to adopt exterior/closure aluminum over steel bodies — a likely trend, though the steel industry argues it can still compete — then the reported Ford rates might reflect how repairers will handle it. 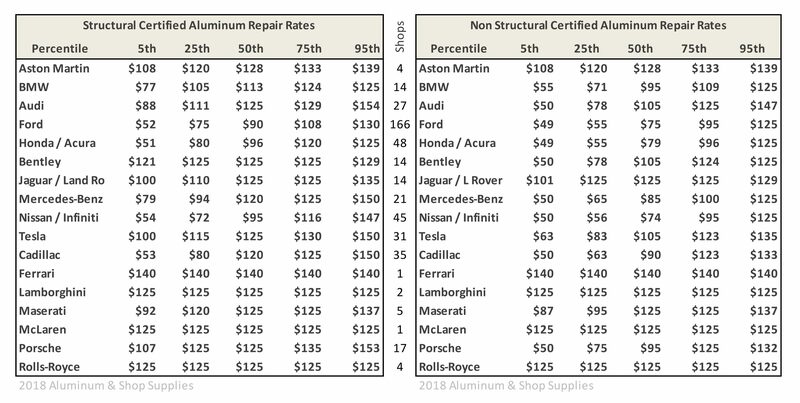 Data from more than 100 responding Ford-certified shops in 2016, 2017 and 2018 — by far the highest turnout of the OEMs examined — found the median Ford nonstructural aluminum rate declining slightly, from $80 in 2016 to $77 in 2017 and $75 in 2018. That rate represents the 50th percentile, in which half of all surveyed shops charge more and half charge less than the amount. As this implies, shops in any given market or nationwide are going to obviously have a range of rates. The 25th percentile reflects an rate exceeded by 75 percent of responding shops. Conversely, the 75th percentile figure still finds 25 percent of shops billing more than that amount. What’s fascinating here is that the 25th and 75th percentile are also remarkably consistent. The 25th percentile for Ford was $55.75 in 2016, $56 in 2017 (which might have just reflected a decision by the survey authors to use round numbers), and $55 in 2018. The 75th percentile rose from $95.75 in 2016 to $100 in 2017 and then fell back to $95 for 2018. It seems as though the market is accepting these rates; whether they’re enough to appropriately recoup the individual shop’s costs is unclear, considering inflation was 4.62 percent between 2016 and 2018. Ford’s structural 25th and 50th percentiles held consistent at $75 and $90 all three years, respectively, while its structural 75th percentile rose from $110 in 2016 to $111 in 2017 before dropping to $108 in 2018. More than mainstream OEMs might opt for aluminum over steel rather than completely aluminum vehicles. Audi, for example, notably changed its A8 from its historic all-aluminum format to a mixed-material design. Audi’s 50th percentile nonstructural rate rose from $85 in 2016 to $105 in 2018 for Audi-certified shops, though far fewer shops responded last year. Its structural aluminum rate rose from $95 in 2016 before holding steady at $125 in 2017 and 2018. Tesla is an interesting wild card, as it is trying to make the Model 3 a mass-market vehicle with $35,000 base models while continuing to sell higher-end vehicles like the Models S and X. It also closed out 2018 ahead of all luxury OEMs except BMW, Mercedes, Lexus and Audi, according to GoodCarBadCar. The Model 3 uses more structural steel than its counterparts but retains some aluminum, based upon first responder guides. Tesla-certified shops’ 50th percentile nonstructural rates rose from $85 to $105 between 2016 and 2018, while their structural aluminum rates were $95 in 2016 before sticking at $125 in 2017 and 2018.